What happens in winter to the wide-open lands that are so good to go hiking and off-road driving? Does it simply go to sleep, only to be woken up again in the spring? NO! It turns into a winter playground ready for snowmobiling. One of the best places in the United States for the ultimate snowmobile adventure is Montana. Let’s take a look at what you can expect here! Fishing is one of the most fun sports that I can think of. It’s a great way to enjoy nature and time away from technology while bonding with our brothers and testing our skills against nature. Unfortunately, as people travel farther and farther to enjoy new locations, we are taking invasive species with us. When introduced in new environments, these invaders can wreak havoc on their new environment and potentially lead to the destruction of what once made that area great. Luckily, there are things you can do to help limit their spread and preserve waterways such as Montana’s streams, rivers and lakes for generations to come. Deep under the earth is a dark and mysterious place where stories become legends and boys become men. It's hard to imagine working thousands of feet under the earth in conditions that could instantly become deadly. But that's where men have toiled for centuries to bring the wealth of the earth to those of us on the surface. From coal mines in England to Gold mines in Nevada, now you have the opportunity to explore them too! While Montana is most popular during the summer months as tourists flock from all over the world to see its natural wonders, there are many awesome things to do in the beautiful state of Montana in fall too! There are a lot of places in the United States where you can go fly fishing, but after dropping my fly in the Missouri River a few hundred times last month I'm convinced that Montana is one of the best. It has a unique combination of beautiful vistas, plentiful fish, diversity of waterways, and the infrastructure to support the industry with equipment, guides, and community. While the mountain streams in the west get the most attention for their abundant trout, don't forget about the prairies in the east since from edge to edge, this state is among best in the nation when it comes to opportunities for an incredible fly fishing experience. Exploring Montana in the "Land Between the Parks"
Earlier this summer, I had the awesome opportunity to embark on a more than 4,000 mile road trip from San Diego to northern Montana and back again. When most people think of visiting Montana, they often focus just on exploring parks like Glacier National Park and Yellowstone. Sadly, everything else is "drive through country" for most visitors. That's the fun of a long road trip though, it gives you the chance to slow down and explore a little bit. You never know what you might find! In our case while we could have simply driven from Gardiner Montana (North Entrance to Yellowstone) to West Glacier in one day, we decided to explore a bit instead. Happy wife, happy life… or at least that’s what they say. At least once a year, it’s a great idea to take that special girl in your life out on a nice romantic getaway with your partner. For me though the reality is that I travel almost constantly with Heather and we've been all over the country on road trips where we are sitting together for 8-10 hours each day. While I love traveling with her, there’s no denying it’s going to be a different dynamic than a trip with your guy friends, but I find that it brings us together in a good way. Experiencing the world with your wife can be a lot of fun, if you know how to plan it right! Some vacations are meant to see something specific and others are meant to escape from it all. At one of the more than 100 Montana guest ranches, you can do both. While it's easy to be cynical and think of these properties as nothing more than "guest ranches" where you can go and sip scotch on the porch while watching people pretend to be cowboys for your benefit - this state has a vibrant ranching industry beyond tourism too. Summer is almost here and like most of us, I'm sure you are starting to plan your vacation schedule for the upcoming months. Really though, why limit yourself to just the summer months? There are adventures you can take all year round, so it's time to make room in your schedule and change some preconceptions you might have about your travel schedule! One of the beauties of a state as open and free as Montana is that activities you wouldn't (or couldn't) consider elsewhere suddenly become possible if you are brave enough. For instance, many people enjoy parasailing and thousands more people enjoy backcountry skiing - so how about combining them? Hunting can be a great way to take a break from busy city life and a chance to explore the quiet and beauties of nature. It's a great way to help you "Purge" and let go of unwanted feelings, memories, or conditions, typically giving you a sense of cathartic release. While there are many places across the country where you can do that, few are as picturesque and rugged as spending a few autumn days in Montana. Fishing is the perfect opportunity to unwind, take in beautiful scenery, and do something you enjoy either by yourself or with a group of friends or family members. If you visit the same fishing spot quite often, a change of location can be good for you. It may seem like a difficult task to find that ideal fishing spot that has everything you're looking for, but there are many great areas available right in America. The LARK - Bozeman Boutique Hotel and Montana Adventure Basecamp! Thinking about heading out into the wilderness for some Montana fly fishing? 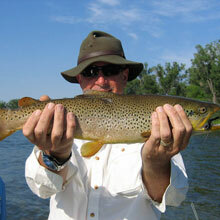 The Montana Office of Tourism was nice enough to help us out with a list of some of their favorite fly fishing lodges. I strongly encourage you to click on the links to check out the individual lodges. If you are anything like me, you will instantly want to whip out your checkbook and start making plans!